For a mining town, Port Hedland is pretty ore-inspiring. Its export port is one of the worlds biggest, and long ships dock in its harbour where the blue-green sea meets the dusty red earth. But you don’t have to be a miner to find a reason to visit Port Hedland. The second largest town in Western Australia’s Pilbara region, Port Hedland also has calm beaches, art galleries and cool places to eat. 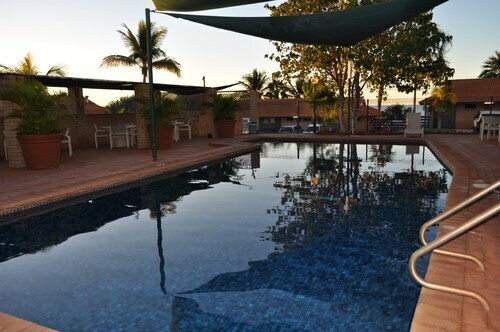 Dig up a great deal with one of our Port Hedland hotels. Before white settlement, the Pilbara region had over 28 languages, and the Karriyarra people were Port Hedland’s traditional owners. Dutch explorer Gerrit Frederikson De Witt was the first European to come across Port Hedland in 1628, but it was Captain Peter Hedland who turned it into a pastoral town. Iron ore was discovered in the Pilbara in the 1960s, and around the same time, a wharf was built to cater for the solar salt industry. These days, Port Hedland has a permanent population of about 20,000, and mining giant BHP Billiton has seven mining sites in the Pilbara, including facilities at the Nelson Point port. If you’re interested in learning about the mining industry, take a 45-minute bus tour of BHP Billiton’s facilities and find out how a bucket wheel reclaimer works. Check out the ships going in and out of the harbour or the long trains pulling in to town via the Mount Newman Railway. Feel like a swim? Cemetery Beach – don’t let the name throw you, it’s actually quite pleasant – extends 1.3 km from the local cemetery and is a peaceful place to spot flatback turtles and maybe a few locals from the plot next door! But the most popular beach for swimming is Pretty Pool, a winding inlet lined with sand and a park with BBQs and shaded picnic tables. The Courthouse Gallery, a green palm-tree fringed oasis in Edgar Street, is the go-to place for all things artistic. Indigenous art exhibitions, craft markets, jewellery making workshops and locally-made gifts are just some of the things this creative bunch do. You can find cool cafes in Port Hedland too, like the Silver Star, which is inside a 1930s-style American train carriage. You can book a flight to Port Hedland with us or catch a bus from Perth if you don’t mind a long scenic drive. 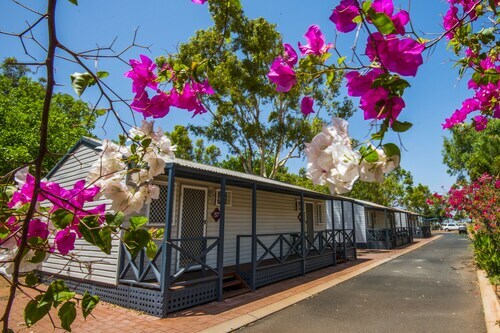 Book your Port Hedland accommodation with us to experience the unique culture and one-of-a-kind activities of this down-to-earth destination. How Much is a Hotel Room in Port Hedland? Hotels in Port Hedland start at AU$117 per night. Prices and availability subject to change. Additional terms may apply.